BLOODLUST - a Lightroom Preset Collection, specifically designed for touring and live music photography. Presets in BLOODLUST are designed to provide beautiful color grading, and, when applicable, counteract the saturation and harsh highlights of concert lighting, swapping unflattering colors for vibrant shades of blues (and, in one case, red) instead. HELLBENT (i, ii): adds a high contrast / HDR effect, changes harsh purple and red tones to vibrant teals and blues. Hellbent i is a desaturated effect, Hellbent ii is more vibrant. 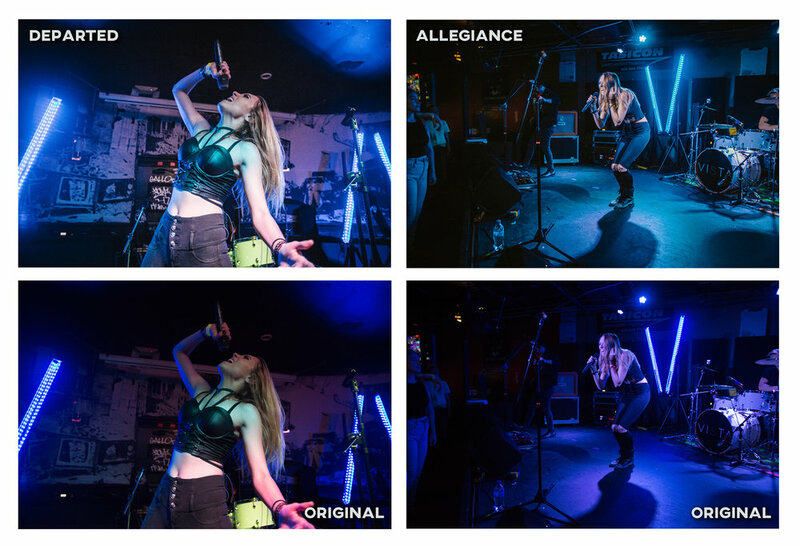 DOMINANCE: combination of split toning and color grading, designed to re-color even the harshest concert lights.